Early morning as the sun comes up is a great time to go birding, but it’s not a great time to take photos of birds. I had a devil of a time focusing on this one, and the low light situation made the photo grainy. But hey, I saw a Madagascar hoopoe (Upupa marginata)! Aren’t they cool? They aren’t woodpeckers, but they fill a similar niche in the ecosystem by eating insects from dead wood and tree cavities. And they look a little like the cartoon version of a woodpecker. I love the contrast between the striped body and wings and the orange crown. I may have worn a few outfits of a similar color scheme in my time. 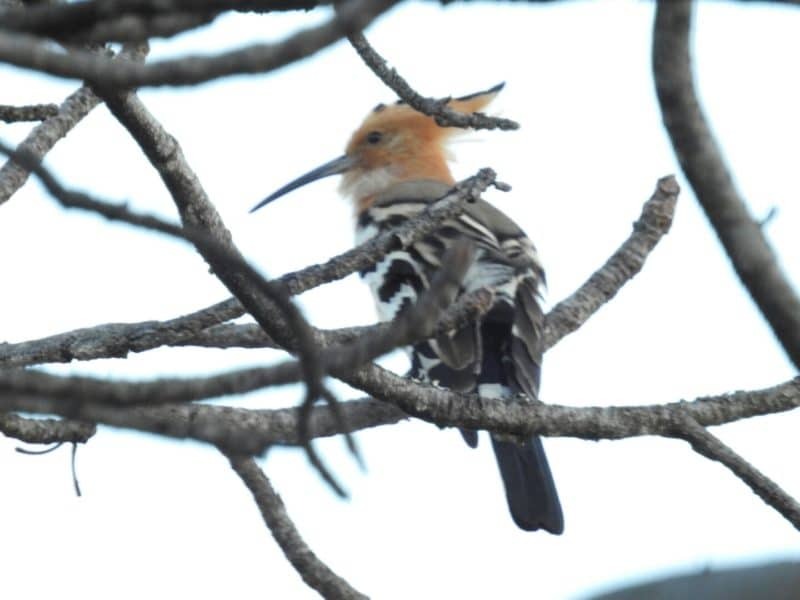 This was my second Madagascar hoopoe sighting. I saw one yesterday morning as well, but it flew by so fast I didn’t have time to get my camera out. This one landed on a tree and bounced around for half a minute before leaving.